AGUA Masters and longtime triathlon coach Meghan Newcomer conquered the world on foot in seven days. 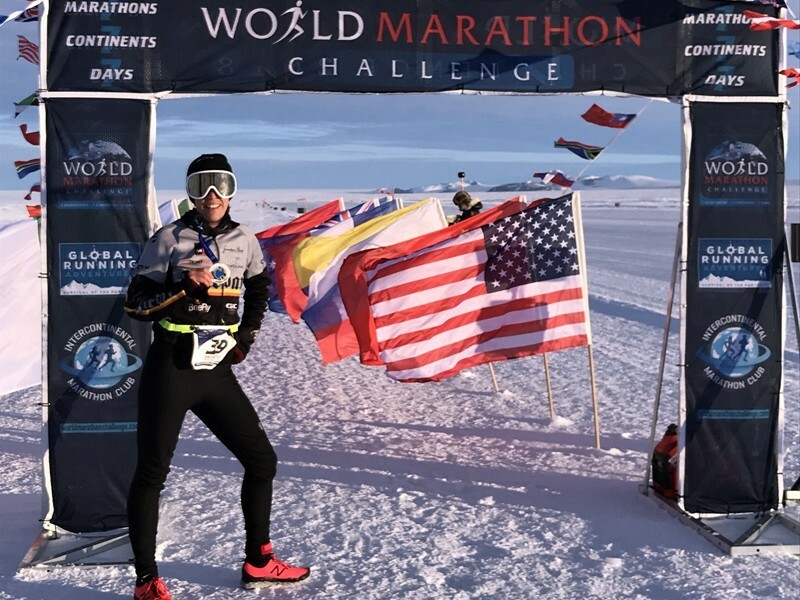 Stepping up to the ultimate endurance feat, Meghan completed the 2018 World Marathon Challenge—seven marathons on seven continents in seven days. If you asked Meghan a year ago if she thought she would cross the finish line, she would not have believed you. After all, completing one marathon is daunting enough for most people. The thought of completing marathons in Antarctica, Africa, Australia, Asia, Europe, South America, and North America in 168 hours would have most people running the other direction. But Meghan is not most people, and she was inspired. In 2017, Meghan and the Asphalt Green community lost a dear friend and beloved personal trainer and soccer coach Cyril Charles. When it came time to sign up for the World Marathon Challenge, she decided to raise acts of kindness in Cyril’s honor. With a strong sense of purpose, Meghan could put her focus into training. However, unlike other endurance events, there is no book on how to train. Prior to 2018, only 11 women had completed the World Marathon Challenge. In 2018, 49 competitors finished, 12 were women. Using her own coaching background and advice from previous racers and ultra-marathoners, she developed a plan that struck a balance between logging enough miles and recovery. She knew getting to the starting line healthy at the first stop in Antarctica was key. She relied on patience and mediation, and reading the acts of kindness people were spreading in between the grueling training hours kept her going. “Mailed a friend going through a hard time a hand-written card,” “helped carry a woman’s groceries to the cab door since she had her hands full,” “volunteered with special needs adults,” and “gave a confused tourist a swipe on my metro card” were a few of the sentiments shared. When Meghan arrived at the first race in Antarctica on January 30, she knew she had to trust in her training, but it was off to a bumpy start. 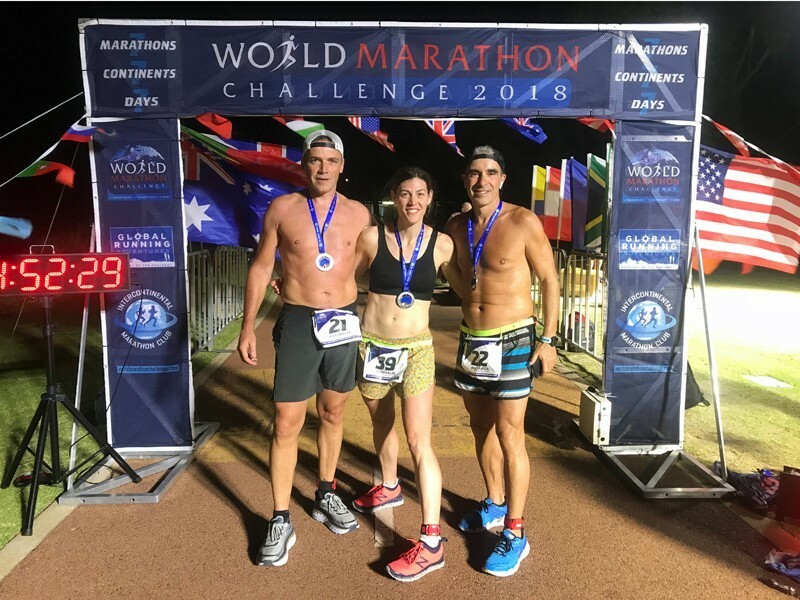 It takes a unique group of people to commit to the World Marathon Challenge, and throughout the journey she met many interesting individuals. There was a man with Parkinson’s, a couple of teachers, a woman who won Survivor, and high-profile businessmen, among others. Though all of the races were different and special in Meghan’s eyes, the one that stood out as her favorite was the third marathon in Australia, where she ran with two businessmen. They were telling stories and playing music, which made the miles go by fast. She remembers feeling more energized after the competition than when she started. When Meghan got to the final marathon in Miami, she felt relieved. 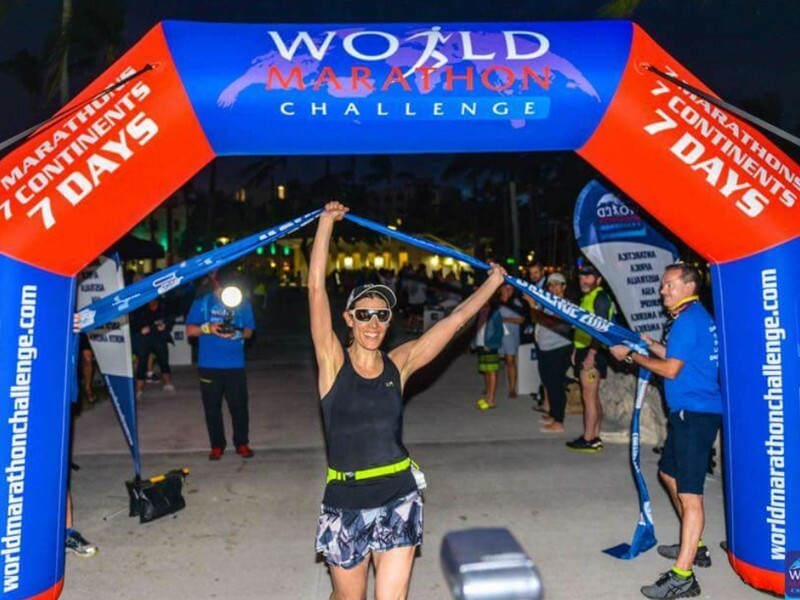 Just five loops by the water separated her from completing the World Marathon Challenge. Hundreds of screaming people with signs and a surprise visit from her sister pushed her through the final stretch. To celebrate, one of the competitors threw a party, and then she went out to a nice dinner, complete with champagne, with her sister and a friend who also cheered her on in Miami. Reflecting on the experience, Meghan learned a lot about herself. Meghan finished in second place among the women. Proud would be an understatement. Want to train with Meghan? She’s available for private swim coaching. Learn more.